Tinker’s Creek is named after Joseph Tinker, the principal boatman for Moses Cleveland’s survey crew, who died in a boating accident on a return trip to New England. 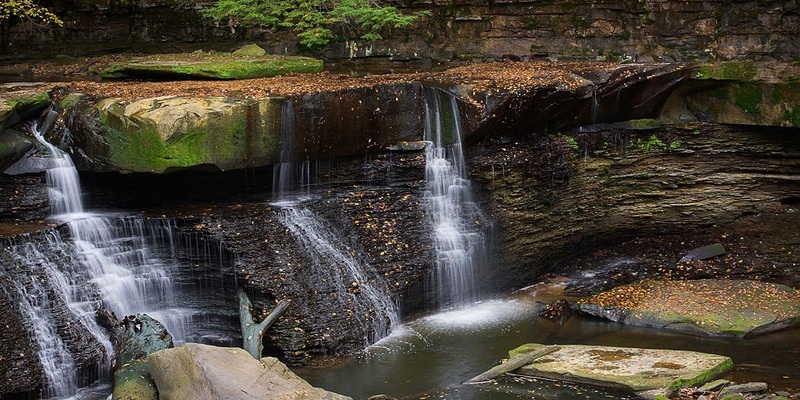 The steepness and rockiness of the Tinker’s Creek gorge, now a part of the Cleveland Metroparks Bedford Reservation in Northeast Ohio, made much of the land along the creek bed inaccessible for homes and farming securing its preservation as a natural area. Tinker’s Creek is the largest tributary of the Cuyahoga River in Ohio, draining parts of 24 different political jurisdictions, spanning Portage, Geauga, Summit, and Cuyahoga counties. Tinker’s Creek has a drainage area of 96.4 square miles and a total length of about 30 miles. For over 12,000 years Tinker’s has been carving out a valley through Northeast Ohio. The watershed lies on a glaciated plateau, and soils are mostly silt loam and clayey silt loam. Wetland swamps, bogs, and fens are common in the upper watershed. Flows in the lower section of the creek are highly influenced by the discharge of treated wastewater from upstream wastewater treatment plants. Portions of the stream are on bedrock and form waterfalls, which are a natural barrier to fish passage. The lower portions of the stream have formed the 190 foot deep Tinker’s Creek Gorge, which is a National Natural Landmark. Tinker’s Creek Watershed Partners (TCWP) is a non-profit, 501(c)(3) watershed organization officially established in 2006. Our mission is to protect and restore water quality and habitats of the Tinker’s Creek watershed through community partnerships. TCWP is governed by 15 dedicated volunteer Board of Directors who bring a variety of expertise in the fields of stormwater management, environmental education, engineering, natural resources conservation, planning, and economic development. TCWP is guided in their efforts to protect and restore the watershed and educate the public by three Ohio and U.S. EPA endorsed nonpoint source implementation strategic plans (NPS-IS Plans). Editor’s Note: Marissa Petherbridge is the Assistant Watershed Coordinator for Tinker’s Creek Watershed Partners, an EarthEcho Water Challenge partner and test kit donation recipient. We are proud to work with the Tinker’s Creek Watershed Partners team to help educate and engage community members in protecting this important body of water.